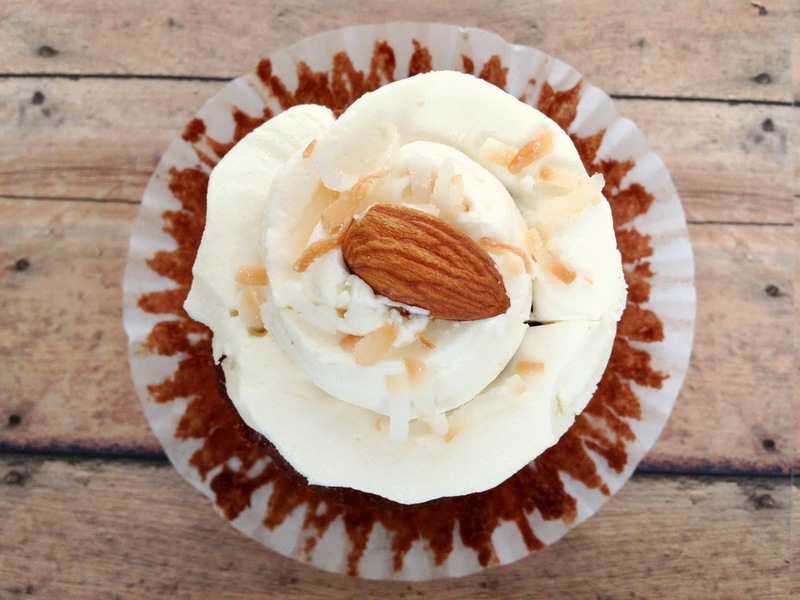 I am so excited to share with y'all this awesome cupcake recipe! Now, when I say I love to bake, I usually mean bread... but I have been feeling like I really need to venture out of the safe zone and work on my cup-caking skills. After all, I am my mother's daughter! That woman can make anything! I was inspired by Chobani's #madewithchobani project to create a recipe using yogurt. If you look up that hashtag you will find some awesomeness created by some awesome people. Now when I think yogurt, I can only think of eating it with a spoon. Seriously I have no imagination. But non the less I had to give it a shot. Conveniently enough my friend was having a birthday shindig the other night and thought it best to make some cupcakes and bring them, or else I would eat them all. As I was standing in the dairy isle looking at all the yummy flavors of yogurt made by Chobani, I was drawn to the coconut one! I have had plenty fruity yogurts in my life, but never have I had one that tastes like coconut. And boy have I been missing out!!! All the possibilities came rushing into my head at that moment and I had to go for it. I can honestly say that these are some of the BEST cupcakes I have even eaten. And my friends agreed! You seriously have to give these a try. The cake is SO moist and more dense than a regular box mix so it doesn't fall apart as you eat it. The icing I used is a classic homemade butter cream (is there anything better?). These are also completely amazing served straight from a night in the fridge... yes... I did have cupcakes for breakfast today. I want to encourage you to create something great with Chobani greek yogurt and join the project! 1. Preheat oven to 350 and prepare 12 cupcake liners by spraying lightly with non-stick spray. 2. Beat yogurt, egg whites and vanilla with mixer until well blended. In separate bowl mix remaining ingredients. Add dry ingredients into the yogurt mix and blend on medium until smooth. Spoon into liners until just over half full. Bake for 20 min or until toothpick comes out clean. 3. 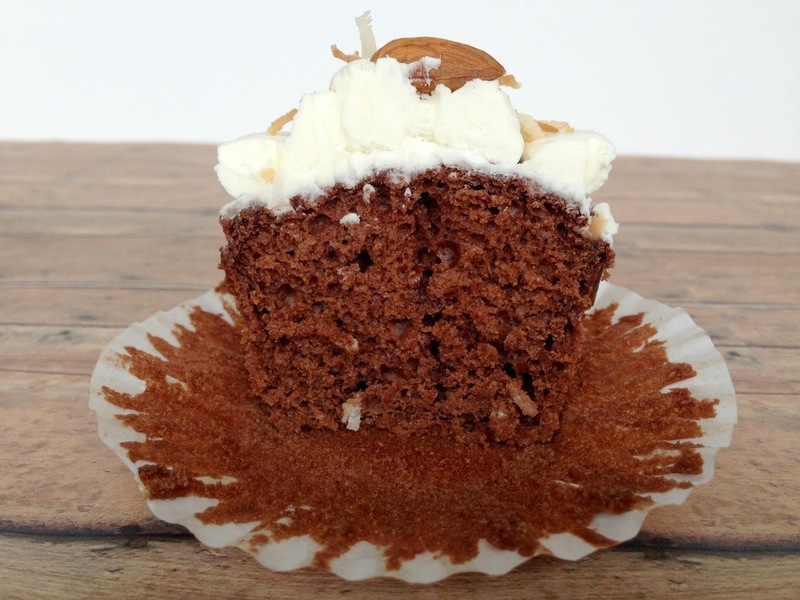 Prepare icing while cupcakes are baking. Blend butter, sugar and salt together until smooth (about 2 minutes). Add in vanilla and milk and continue to blend. If too thin add a little more sugar; if too thick add a splash of milk (once icing is "too" wet its hard to get it back so please be conservative with the milk). Move your oven rack to the highest level and set you oven to 500 for broil. 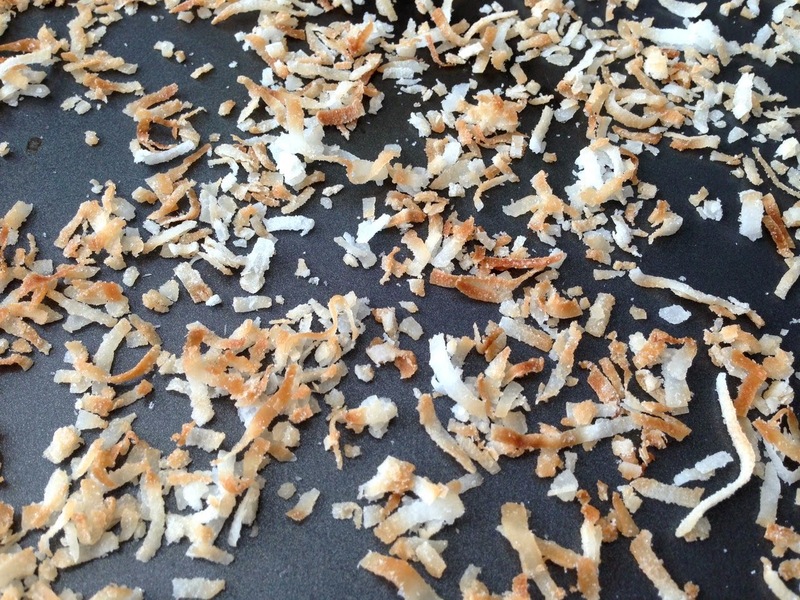 Spread a handful of coconut onto cookie sheet and place in the oven. DON'T WALK AWAY. Remove when the tips of the coconut start to turn brown. 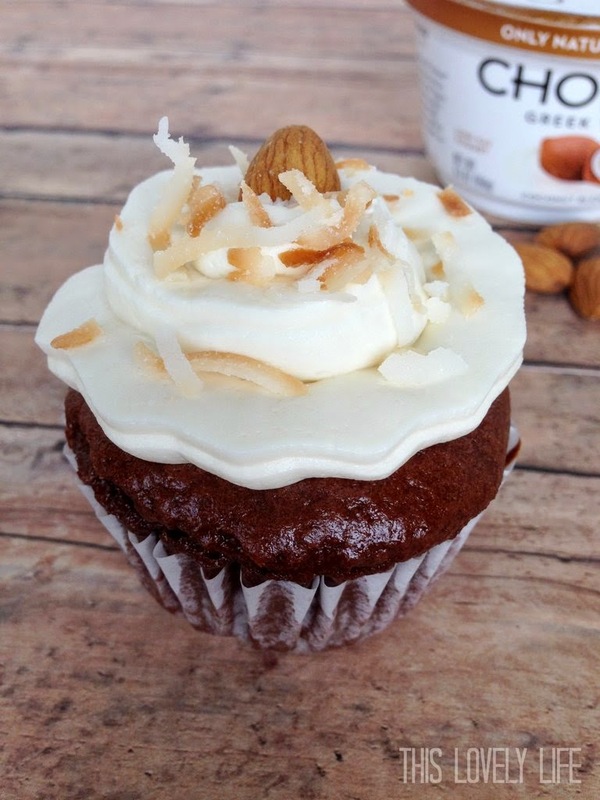 Top frosted cupcakes with coconut and an almond.